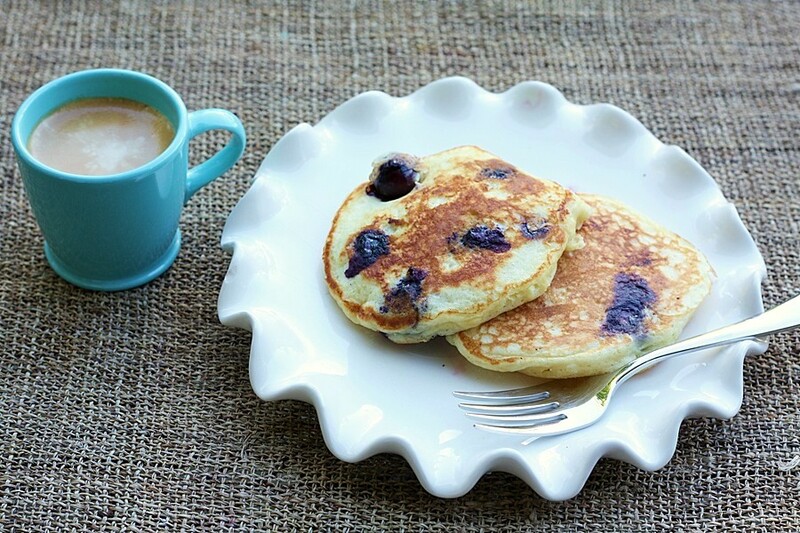 Blueberry pancakes, what a wonderful way to wake up in the morning. I let my older daughter choose the breakfast, and this was what she had in her mind. I went to Epicurious, and found this perfect recipe (perfect because I had all the ingredients) from Bon Appetit. It had almost 4 forks, which always is a good sign. I was just a little concerned because the blueberries were gigantic. Bigger than I had ever seen in my life – and I was worried about the weight of them in the pancakes. Well – I had good reason to worry, this was a very tough batch. Not only did they keep flying out when I flipped them, the first batch was raw around the blueberries. So – I tried a different method – the same method I use with chocolate chips. I just added the plain batter to the pan. Just when I thought they were cooked enough to flip – I added the blueberries, and pressed them down into the batter. I still lost a couple of blueberries, but at least they were cooked all the way through. These pancakes were delicious – so delicate and tender on the inside – and crisp on the outside. The blueberries added just the right amount of sweetness for me – but of course my family doused them with maple syrup. I am excited to try this with baby blueberries, right off the trees from our backyard – if the sun ever comes out to ripen them. Preheat oven to 250°F. Place baking sheet in oven. Whisk first 4 ingredients in large bowl. Whisk buttermilk, eggs, and 2 tablespoons butter in medium bowl; stir into dry ingredients. Fold in berries. Heat large nonstick griddle or skillet over medium heat; brush with butter. Drop batter by 1/3 cupfuls onto griddle. Cook pancakes until brown, brushing griddle with more butter as needed, about 3 minutes per side. Transfer to sheet in oven to keep warm. Serve pancakes with maple syrup. That is the perfect way to wake up ! I love me some good pancakes….these look delicious!!! I want these blueberry pancakes. They look amazing. Blueberries are actually my favorite thing to put in pancakes over every other type of fruit–they just make sense, ya know? Aren’t blueberry pancakes some of the best things in life? I should make them more often. Wow, those blueberries look great. Everyone loves pancakes!! I definitely do. They’re my favorite go-to breakfast dish. My favorite are these Easy Cottage Cheese Pancakes Thanks for sharing yours! I just made these for breakfast. They are so delicious! Thank you for the recipe.